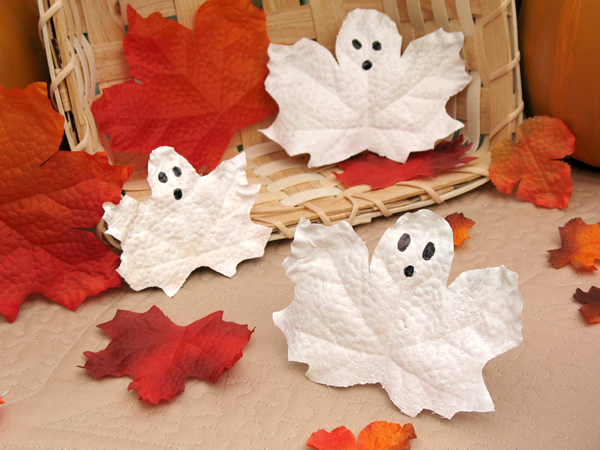 Scare up a little fun by adding these haunted holiday decorations to your holiday table. You can even write peoples' names on them to turn them into place cards. Just coat the leaves with sparkly white frost and then draw on ghost faces! 1. Turn each leaf so the points face up. Use the scissors to round the top to resemble a ghost's head. 2. Working on a waxed paper-covered surface, paint the leaves white (front and back). If needed, give them a second coat. 3. While the paint is still tacky, sprinkle the surfaces with glitter. 4. Once the paint dries, use the marker to draw on ghostly facial features.